Discussion in 'T&AA - Travel and Anything Automotive' started by JD666, Sep 11, 2012. Well if you call doing 5,400 kms in under 2 months on a bike Long term enough. Still I feel its a decent enough odometer reading to give the bike its due. Total Cost: INR 1,31,850/- on road. The first service was carried out dot at 1003 kms. Bike would stall and engine would switch off if the clutch would be pressed in 2nd and 3rd gears even. There was some glitch with the ECU. It got resolved when the service engineer had a look at it, and reset some settings on the ECU with the FID tool. Chain would get excessively loose. - Requiring adjustment every 300 odd kms or so. I put it down to a new chain set + Sprocket set bedding in. However the issue still persists from time to time. Keeping the bike under 6000 rpm translates to roughly 72-75 kmph in 6th. This ensures that I get a decent cruising speed, even while running her in. The engine oil had been changed from whatever the bike came with to Semi Synthetic after 1000 KMs. Though over the next 1500 kms I was not too happy with the performance of the engine. It apparently started sounding rough and vibrations had gone up. Since I was already preparing for the Leh trip, I decided to switch to Fully Synthetic since the trip did involve nearly 3000 kms of riding and changing Oil in between would be troublesome. The Bike had gotten more refined. The exhaust note had developed a grunt that was very-very enticing. She revved even more freely after the first service. I could zip her out to the max and understand and come to terms with her performance capabilities. Braking - Superb. Confidence inspiring the whole time. To the extent that at times I would use/prefer the Front-Brake only and not even bother about the Rear one. Tyres ( Soft Compound MRF ) These contribute a lot to control. I was leaning at insane angles in the mountains on curves and hairpins with a whole load of luggage on the bike! Handling - Extremely nimble and flick-able. The lack of extra body-length and concentration of all mass down low & close to the engine ensures that you have one hooligan yet controlled of a bike in your hands. Engine - Extremely responsive, the Fuel injection making its presence and worth felt at every stage. The low end grunt and the sensation of oodles of torque from the engine makes for an extremely fuss-free ride in city traffic. Irrespective of which gear you are in, you know that the engine has enough grunt to pull along easily. Yes the bike can do silly things like pulling in 6th gear at 30 KMPH, though thats not something that I would recommend to anyone to test/or keep doing again and again. Features/Comfort - The Flat handlebars, extremely forward stance on the seat and foot pegs (especially) do make for an uncomfortable ride at first. However you learn to adjust your posture accordingly. Tall people will feel cramped on the machine ( above 5' 10" ) and shorter people have complained that the brake lever is too long ( too far away from the toe for regular comfort ). The brake lever did feel funny initially however I got used to it in a couple of days. MFD - Multi-Function display keeps you fully-informed while riding however readability can be a bother in the afternoon or when the sun is overhead. Headlight deserves a special mention, the 60-55 W Unit is superb. Even on the highway the beam spread and visibility is excellent. At times you would find yourself riding in Low beam since its more than adequate ( which is also how it should be ). Service/Customer Care - Very impressive I must say. The Bajaj Service centre in Gurgaon that handles Dukes as well is very well equipped and the staff is properly trained. I like a clean mechanic, with clean tools and no hammers in sight and that's the kind of work I got there. These guys know their work, and are pretty good at it in-fact when the Service Engineer got to know that I am prepping my bike for this trip, he made sure that he gave the bike a complete look over, ensured that the Mechanic tightened and checked all screws and bolts on the bike and even advised me for parts to carry along that I could possibly need. Long Distance touring/Riding - Though the seat can be a pain, ideally this vehicle is not designed for Long distance riding/touring. Its a point and shoot urban machine that does not mind the occasional highway. However with over 2800 KMs over 14 days, it was my regular companion and faithful steed that took me through all kinds of broken roads, streams, rocks, gravel, mud, muck, dust and sand. I feared that some bumps would/could damage the rims, however she took 'em all in her stride. No issues what so ever. To the extent that I had to refill air only once in the entire trip. ( I had filled up with N2 before leaving Gurgaon ) That too once we got back to the plains and the air pressure normalized. The seat could do with some more contour/comfort/cushioning but then thats really needed if you are planning a saddlesore event in this. The radiator had a tendency to get choked/clogged very fast. This was partially due to the bikini type front mudguard ( Covering, but still showing nearly everything ). A lot of mud keeps splashing onto the Radiator fins. (Simple solution - Install a mud flap if you want to go cross country in this ). The closed loop fuel injection System meant that I got the best from the engine with no worries/concerns of the engine running too rich at high altitudes. Also it gave me a more than decent mileage than what I could expect ( 30-34kmpl ) for the whole trip. The Duke needs an Oil change, Air filter replacement and as a precaution I'll be replacing the Spark plug as well. Everything needs a good cleaning especially the brakes to get rid of any dust/pebbles that might have entered. The chain requires tightening and cleaning. Other than that the bike is running strong and the grunt is still the same. 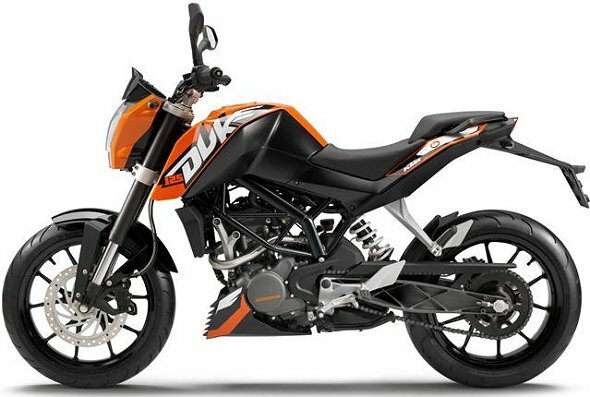 Fingers crossed about the durability/reliability of the KTM Duke 200. Its proving to be the most reliable bike amongst all the other bikes in the whole Leh-2012 trip, just needed the regular chain cleaning and adjustment. More on this as I rack up more kilometers on the bike! Fireblade, ManISinJpr, idutt and 1 other person like this. Nice writeup. But a new chainset & sprocket already?? WTF? what on earth was causing it to give trouble with less than 5k on a brand new bike? No, I meant that the issues with chain getting loose earlier on were attributed to a new chain + sprocket on the bike ( it was barely 500 kms done ). The chain and Sprocket are in good condition, Will last a long time! Oh, and the OKS lube is better than the MOTUL one as I found out. Its got a waxy characteristic to it, which helps keep it cleaner since it attracts lesser muck. Great little read. Short and sweet. Odo Reading - 7000 kms. Not been riding much, however now riding again. - The bike was serviced fully since last update, had a lot of muck around the front sprocket. - The issue with chain getting loose is now resolved, Chain needs setting every 1000+ kms or so. - A lot of vibrations and harshness was being felt. Found that the chain needed cleaning and lubing. - No signs of rusting, paint wear, loss of plating/paint anything. +1 to KTM for that. - The rear tyre has given up the ghost, even though it's far from the wear indicator. Locks up in an instant. Most of my braking is front heavy, but still it tends to lock up. - Brakes are working great. The bike completes a year in 5 days!